you helped us build! The new site design will help you build a bigger, more connected audience by improving new channel discovery, simplifying subscriptions, and keeping your fans plugged in and aware of your new videos no matter where they are. Click here to learn more. So, what does this improved YouTube mean for you as a creator? We are making it easier to subscribe with enhanced channel recommendations. Check out this one-pager for more information. on Air as well as a Reddit IAmA to answer any questions you may have. Stay tuned for more information. Let’s keep building the future of video together. 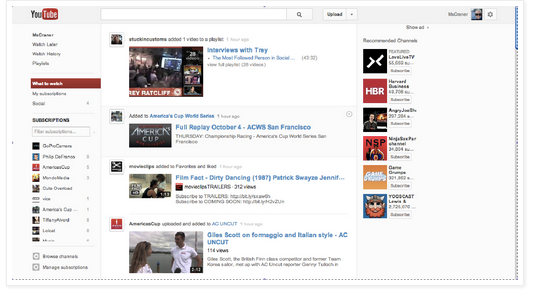 We are excited to announce an improved YouTube, one you helped us build! The new site design will help you build a bigger, more connected audience by improving new channel discovery, simplifying subscriptions, and keeping your fans plugged in and aware of your new videos no matter where they are. Click here to learn more. I am curious about the support of 3D media footage and delivering it to other platforms and display devices. Also does the Youtube studios support 3D stereoscopic filming and editing? Sky and hardware manufacturers are controlling the market and creativity is being blocked by these dominant infra structures. the new layout is awesome but i cant open the description box, or click on the like or dislike button, the subscribe button or whatever buttons except for the player. I think they're on the test phase. It's obvious some bugs will occur during test phase. They're going to fix it right away for sure. Great post. I love the new YouTube. My video production company in New Hampshire is now able to publish and share clips from our video production work on the go, which is a great benefit! hello blogger,i really appreciate your highly thought about this matter through your post.Obviously your post is very informative.If you update your Social account, please visit buy facebook likes For facebook Service. I must admit I have popped in a read a good number of your blogs but I have no idea how to post a response over there, so I'll tell you now how good you are at describing the stuff your at - I must admit I find it insightful to read your blogging. Keep up the good work. If you want to know more about a sites, please visit our website buy real likes.